^ a b c d e f g h i National Institutes of Health, National Heart, Lung, and Blood Institute (June 2006). "Your Guide to Physical Activity and Your Heart" (PDF). U.S. Department of Health and Human Services. ^ de Souza Nery S, Gomides RS, da Silva GV, de Moraes Forjaz CL, Mion D Jr, Tinucci T (1 March 2010). "Intra-Arterial Blood Pressure Response in Hypertensive Subjects during Low- and High-Intensity Resistance Exercise". Clinics. 65 (3): 271–77. doi:10.1590/S1807-59322010000300006. PMC 2845767. PMID 20360917. ^ Hubal MJ, Gordish-Dressman H, Thompson PD, Price TB, Hoffman EP, Angelopoulos TJ, Gordon PM, Moyna NM, Pescatello LS, Visich PS, Zoeller RF, Seip RL, Clarkson PM (June 2005). "Variability in muscle size and strength gain after unilateral resistance training". 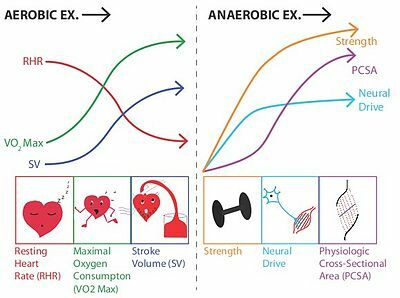 Medicine & Science in Sports & Exercise. 37 (6): 964–72. PMID 15947721. ^ Buman, M.P. ; King, A.C. (2010). "Exercise as a Treatment to Enhance Sleep". American Journal of Lifestyle Medicine. 31 (5): 514. doi:10.1177/1559827610375532. ^ Griffiths, Mark (January 1997). "Exercise Addiction: A Case Study". Addiction Research. 5 (2): 161–168. doi:10.3109/16066359709005257. ISSN 1058-6989. ^ Cohen S, Williamson GM (1991). "Stress and infectious disease in humans". Psychological Bulletin. 109 (1): 5–24. doi:10.1037/0033-2909.109.1.5. PMID 2006229. ^ Borer KT, Wuorinen EC, Lukos JR, Denver JW, Porges SW, Burant CF (August 2009). "Two bouts of exercise before meals but not after meals, lower fasting blood glucose". Medicine and Science in Sports and Exercise. 41 (8): 1606–14. doi:10.1249/MSS.0b013e31819dfe14. PMID 19568199. ^ Wisløff U, Ellingsen Ø, Kemi OJ (July 2009). "High=Intensity Interval Training to Maximize Cardiac Benefit of Exercise Taining?". Exercise and Sports Sciences Reviews. 37 (3): 139–46. doi:10.1097/JES.0b013e3181aa65fc. PMID 19550205. ^ a b Garland T, Else PL, Hulbert AJ, Tap P (1987). "Effects of endurance training and captivity on activity metabolism of lizards". Am. J. Physiol. 252 (3 Pt 2): R450–56. doi:10.1152/ajpregu.1987.252.3.R450. PMID 3826409.